The 2016 debut of Monmouth at the Team won the New Jersey Horse Shows Association’s Show of the Year award this month. It took some daring on the part of co-organizers Tucker Ericson and his cousin, Michael Dowling, to move New Jersey’s oldest horse show out of Monmouth County into the U.S. Equestrian Team Foundation headquarters in Somerset County, more than an hour away. But it worked and was hugely successful on both the sporting and social sides. “We’re excited that it had a great first go,” said Katie Benson, NJHSA president, who runs the Briarwood operation at Black River Farm in Ringoes. “Briarwood’s Derby Day got beat, but that’s fine,” said Katie, who was elected last month as a director-at-large for the U.S. Hunter Jumper Association. “Briarwood had the award for a lot of years, but Monmouth is new and exciting,” she commented. The success of Monmouth at the Team will be reflected in its 2017 show, which is growing to seven days from six and will have three days that are B-rated from the U.S. Equestrian Federation, as opposed to its single C-rated day last year. 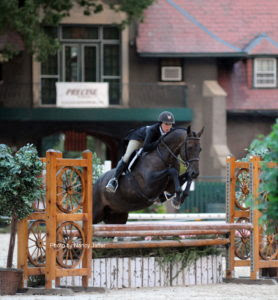 It is adding a $5,000 USHJA hunter derby with fences set at 3 feet on one of the recognized days, but also will have an unrecognized derby, with a $10,000 purse. Fences will be set at 2 feet, 2-6 and 3 feet. The August show turned out to be an end-of-summer attraction in highly competitive Zone 2 (New Jersey, New York, Pennsylvania), drawing a legion of quality horses and riders. “It’s kind of like, if you can make it in New York City, you can make it anywhere; if you can make it in Zone 2, you can make it anywhere,” Tucker quipped. Jumpers are featured on the weekend, a draw for sponsors and “local people who maybe don’t know the sport that well,” said Tucker, explaining they can follow that action more easily than they can the hunters. All of last year’s sponsors are coming back, and they include the banking and car dealership categories, as well as the usual equestrian-related firms. “They see the benefit in equestrian sports,” said Tucker, who is also active as a judge. The USET Foundation will be given a utility building through money raised by the show and the efforts of the show’s presenting sponsor, Precise Buildings. The project is already on the drawing board, but needs to go through the municipal approval process before it can be constructed. Tucker said it is hoped that the building can go up after this year’s show. Once that is completed, a judges/announcer pavilion will be the next project.